A Christmas food appeal was co-ordinated by WCHG to make sure the most vulnerable people in our community had enough food for Christmas. 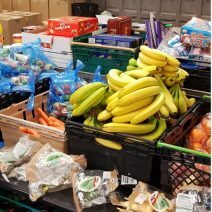 Together with an army of volunteers, 144 Christmas hampers were put together with the campaign generating enough food to feed 425 people, including 243 children who may have struggled over the Christmas period. Hampers contained everything needed to make a Christmas lunch as well as some extra treats too. In addition to these, 40 Christmas Treat Hampers were delivered to Unit E (funded by Our Manchester) to be distributed to families in need over the festive period. Teams across WCHG worked together including the Financial Inclusion and Tenancy Support to make sure families in most need received a hamper. External agencies such as Social Services and Early Help Hub were also engaged. Key sponsors included Lloyds Banking Group, Manchester City Council, Prevention of Breast Cancer Manchester, City of Trees who donated time, cash and food to the initiative. The community centres received 8,567 visits in December. As well as the usual sports and social activities, visitors were treated to a Carol Concert, hosted by the Lifestyle Centre and more than 600 Christmas dinners were served over the period. Young people visiting youth clubs made Christmas wreaths which were taken to vulnerable tenants. 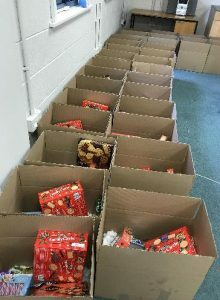 The youth team were successful in their application to be a local ‘Mission Xmas’ distributor in Wythenshawe and 75 deliveries were made with presents for all the children and young people in the household who otherwise would not have received a Christmas gift. Visiting young people at their properties provided a great opportunity for the team to meet parents and carers and build positive relationships with them. It also gave the team an insight into the lives of young people in their own homes. The Enterprise Centre was open through the Christmas time supporting entrepreneurs through the festive period. A drop in was available between Christmas and New Year for young people to meet one-to-one with youth workers in a safe and warm environment. Six young people benefited from this service.